South Koreans are the second thinnest people among those from other developed countries, according to the Organization for Economic Cooperation and Development. The OECD’s annual Obesity Update 2017 report looked at the obesity rate of people aged 15 years and over. Korea ranked 34th out of 35 member countries, with an obesity rate of 5.3 percent, followed by Japan (3.7 percent). The United States has the highest obesity rate at 38.2 percent. 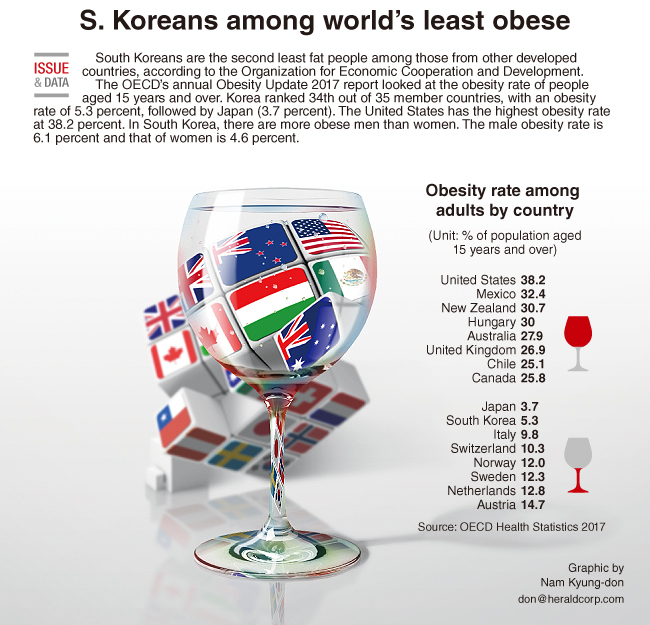 In South Korea, there are more obese men than women. The male obesity rate is 6.1 percent and that of women is 4.6 percent. People who are obese are defined as those who have a body mass index that is higher than 30. Those with a score above 25 are considered overweight.